This is my great great grandparents, Jacinto Pacheco and Anna Jacinta de Mello’s marriage record. It is the culmination of 3-5 years of searching, a good 10 or more years of not being able to search because of my arthritis, and the end of a whole lot of frustration. Why is this record so special? The reason is that I had several unanswered questions about this couple and I was beginning to think I had made an error. Good thing I got that DNA test and prove my cousin and I are related. Before I stopped researching, I found all but one of their children’s baptismal records. I found information on their siblings and parents. But, I couldn’t find anything on them. A few months ago, the records for Achada, Nordeste went online. I scoured through and found Anna Jacinta de Mello’s baptismal record. An awesome find as I now could narrow down the range of years for my search. I didn’t have any luck. 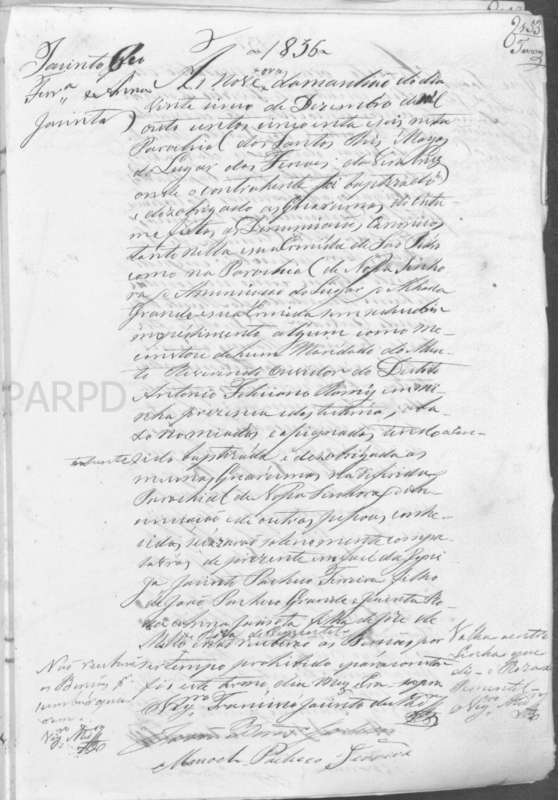 No marriage record, no death record for Jacinto, and the oldest son’s baptismal record was still missing. Last week, Fenais da Vera Cruz went online (aka Fenais d’Ajuda). This is the village Jacinto was from. I began searching for his baptismal record. I found several of his siblings, but not him. In fact, I’m about 2 years from the end of group and I suspect Jacinto will be on the last page. I did better with the marriage index. The genealogy gods were showing me favor. They are indexed. In less than 5 minutes, I went through the Jacinto’s and I found my couple. It was a bit anti-climatic after 15 years of waiting. The marriage occurred 25 Dec 1856 in Fenais da Vera Cruz. It’s a little unusual, though not rare, for the couple to be married in the groom’s village. I’m sure they did it just to throw me off the track. The most important tidbit in this document is that Jacinto is record as Jacinto Pacheco Ferreira. Ferreira was his mother’s maiden name. No one else used this combination that I’m aware of. Some did use Pacheco Grande, but not Pacheco Ferreira. Now I’m wondering if I completely missed his death record because I was not looking for a Pacheco Ferreira. The death records are slim on information for the most part. They include the name of the deceased, their date of death, where they died, some times the village their were born in, and if you are lucky the Priest wrote down the informant and their relationship to the deceased. It is very possible that I saw his death record and thought “Well, I’m not looking for this guy” and moved on. Slowly but surely I’m putting together the pieces. I now have Anna Jacinta’s baptismal record, Jacinto and Anna’s marriage record, and the baptismal records in Achada of their children Manoel (1863) to Theodoro (1876). I’m down to the death record and the two baptismal record. At least I know now that they did get married and I can throw out all my other theories of multiple marriages and step children. David, I think we might have been in contact before, am I right? If you have lines in Fenais da Vera Cruz there is a possibility that we connect. I haven’t done as extensive of research there as I have in Maia and Achada. My Pacheco line is from FVC and I have them back to about 1730. If you’re interested in exchanging information, I’d like to see if we connect.